I only have ten yards of yarn left for the Slouchy Cardi after casting off the hood. I am nuts. And I still have to seam it up. But I have laceweight (2/8) in the same yarn and colorway, so I can use that for seaming. For those playing along at home, this is 4/8 Jaggerspun Zephyr ("DK" weight according to those good people, more like Light Worsted to my mind). I am thrilled to have completed miles and miles of stockinette because I know (if it fits) that this will be one of those go-to sweaters in my wardrobe. That's the thing, isn't it. We moan about miles of stockinette, but it makes for eminently wearable sweaters. So, what's next for Purly? I'm glad you asked. For the needles I'm not quite sure, though I've got a ton of stuff queued up on Ravelry and other ideas in my head. For real life, we have a real move. Yes, Isobel and I are moving to Manhattan on 1 November. Which means that the post should be titled "The Skyscrapers of Insanity", no? And it also means that I am leaving the Suburbs of Insanity. Not really, but really. I love my family and friends here in the Midwest, but I've become an East Coast girl and long to get back. Watching the Red Sox kick tuchus is not the same here, you know? And Riley is going to come live with us, too, as I told Bridget the other day (her Garden Kitty looks a lot like Riley-kins). Spenser has gone back to live with his breeder until she can find him a new home, which is for the best. Now, if we could just find someone to buy the house and get my soon-to-be-ex-husband to get his act together enough to participate in divorce proceedings, we'd be all set. Until then my darling Intended and I will have to wait to make things official. But it's all for real. Someone pinch me. Yet if I wake up I might have to deal with R.O.U.S.es. Eep. They probably have those in New York. And, no, I haven't seen The Princess Bride lately. Maybe I should. Ooh, advanced math. Does Second Sock Syndrome equal one half a finished object? I now know why I don't knit socks. I hate knitting the second one! Even when using lovely Merino Pure on reasonably sized needles. Even when it's a gift for my dear (and only) brother. Even when it's a really nice pattern like the Log Cabin Socks from Handknit Holidays. Sigh. I finished the first one in two days, even after casting on the wrong number of stitches and not noticing until I switched from ribbing to the cable chart. Yup, that's me, Swifty. I'd like to blame this on the head-cold-with-sore-throat I have from la belle, but it's not nice to blame your little one for such things. I did give my brother the first sock, which is why there is no photo in today's post. Again, Swifty McSwift forgot to snap a pic before wrapping. So, I do have to knit up the second sock here soon. And I'm sure I'll feel much better once I do. And, to be honest, it's nippy here in the mornings some days and I would like some handknit socks of my own, so I may yet get my sock knitting act together and do something other than ogle my Rockin' Sock Club stash. Still working on the Slouchy Cardi, closing in on the armhole shaping of the second front. Then there's a sleeve and the hood if I have enough yarn. Shouldn't be a problem, but I decided to leave it for last just in case. I am NOT looking forward to the seaming, but it will give me some practice I guess. I AM looking forward to wearing this cardigan, though, so it will be worth it. I've spent a lot of time on Ravelry the last couple of days, finally logging in my Wilmette stash and queueing up a bunch of things I'd like to make. I wish they would allow you to add magazines to your bookshelf. And I'm a little anxious about adding in the Gloucester stash - there is a fair bit more I think. I was supposed to go to Boston tomorrow with the wee one for visiting, packing, and a meeting with lawyers and ex-husband-to-be, but he's not doing well, so the trip has been postponed. I'm sad to miss Knit Night, but with the dueling colds and all the other stuff going on, it's for the best. Yes, I'm seeing someone. And not to be melodramatic, but he is the love of my life and has been since I was ... sixteen? seventeen? a very long time. Sometimes a crush isn't just about shoes, sometimes it turns into a full-blown love affair. How did this happen? you might ask, and Why did you marry someone else? You'll have to wait for the movie for the complete story. But the blame for some of this falls squarely on the cicadas. Remember this post? Well, Nicholas and I started to correspond, first about children and divorces then life and everything. After a four-hour telephone conversation it was clear that we had both matured, having been put through the emotional wringer, and still had an intense connection, even after a twelve-year separation. Suffice it to say that things are going very well, and the puzzle pieces are falling into place, albeit slowly (why does it take almost three months to retain a lawyer, soon-to-be ex-husband? Sigh). Happiness is here and growing every day. More later, but Isobel needs attention. 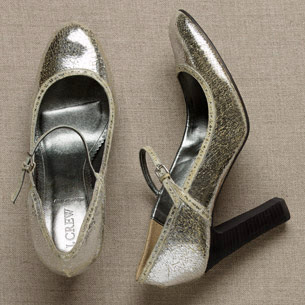 So, the folks at Outblush just highlighted the shoes I've been crushing on for months, ordered and returned (too big), then ordered again (just right), and wore to a charity event on Friday. Does that make me cool? I don't really care. And I don't really care that the shoes are way too high for me to wear for more than a few hours. They are seriously cute. See? The Koigu is lovely. I really like the drape and sproingy-ness of the yarn. I ended up dipping into the fifth skein but should have enough for the endpaper mitts I have yet to cast on for the other KAL I'm down with. Knitting this in sock yarn is much better than laceweight. I bet worsted would go even faster. I'm back at work on the slouchy cardi, which suddenly seems boring (so not cool): all that stockinette, and the armhole shaping on the front is a little confusing, which probably has more to do with putting the sweater down to knit Clapotis than the pattern. I should have finished the front before switching gears. Lesson learned? Probably not. It will be a nice sweater when it's finished. More yarn was acquired over the weekend: some Encore Worsted in grey for a baby sweater and a skein of Alpaca with a Twist's Baby Twist - last skein, darnit, but I think it will be enough for the cool Secretary style vest from Blue Sky Alpacas once I acquire some Brushed Suri in Fudgesicle. I know, Encore doesn't make me cool. But that vest might. New York was wonderful - perfect weather, good food and company, a foray to The Age of Rembrandt at the Met - even if I didn't visit a single yarn shop and missed Spin Out in the Park. I did get a fair bit of Clapotis knit up, especially as Bravo had a 30 Rock marathon during my return flight (love DirecTV on JetBlue!). Tina Fey is awesome! Most of the episodes I'd seen, but there were a few that were new to me. Anyway, I giggled my way back to Chicago and the leetle lady, who had a great "bacation" with Grandma and Grandpa while I had mine back East. So, this show at the Met. What a ridiculous way to organize - by robber baron donor! Never mind that there are five Vermeers and 20 Rembrandts, it's all about who donated the paintings to the museum and when the pieces entered the collection. The show did crystalize for me that I prefer Dutch floral still life painting, as well as other still life works (table scenes, mostly) to portraits and plein air pieces. Frans Hals leaves me cold. And the Vermeers were not as stunning as I had hoped. Well, actually Young Woman with a Water Pitcher is gorgeous, and A Maid Asleep is a tour de force of light, which is what I realized I respond to in Dutch painting. Maybe that's a "duh" for everyone else, but it was a little revelation for me. The show was crowded (we went Saturday early evening before dinner in Soho), but it is fun to experience the New York crowd. I'll try to get a progress shot of Clapotis this afternoon (it's incredibly misty here this morning). The yarn is great, and the drops are fun. The first one I made was for my mom in handpaintedyarn.com's wool laceweight, a single-ply, sticky yarn that made the drops a bit of a chore. I'm on the third skein and think I will end up using four of the five, leaving the last skein of Koigu for Endpaper Mitts. In knits in New York news, I did wear my Reading-in-bed Shrug Saturday morning out to brunch.